Find Differences Between Any Two Microsoft Access Databases or Objects! Losing your work or someone else's work, or not realizing what changed can cost you considerable headaches, money, and embarrassment. Trying to manually compare Microsoft Access objects is slow and error prone. Total Access Detective handles these issues for you thoroughly and quickly. Total Access Detective reveals exactly what changed between Microsoft Access databases, objects, code, and data! In its seventh major release since its debut in 1995, Total Access Detective is trusted by the Microsoft Access community around the world. With each version, we've added more functionality to maximize your control of your Microsoft Access databases, and improve your productivity. 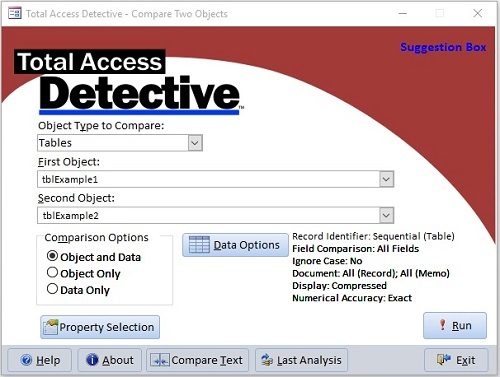 Discover why so many Microsoft Access users and developers rely on Total Access Detective to pinpoint exactly what changed in their Access databases. Eliminate the guesswork and get on with your real work! Find differences between any two objects in one Microsoft Access database, including fields, controls, properties, macro lines, module code, and data. Find differences between two blocks of text from text files on disk or the text you copy and paste. 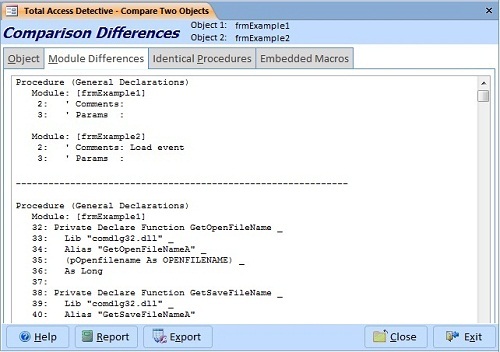 Compare them as plain text or modules to use our VBA parser to perform procedure by procedure comparisons. After comparing two tables for data differences, you can create a new table that combines the records from your tables applying your rules of which table's new and modified records to keep. 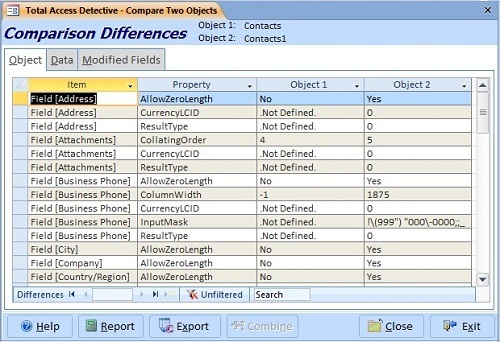 Total Access Detective is available depending on whether you want to find differences between objects in one database or between databases. When you want to compare two databases, open our database comparison program and point to your two databases. Total Access Detective then examines all the objects you selected and presents the results. Results are displayed on screens that you can view, sort, filter and search. Reports are available and you can even export the results to a table in your database. Documenting differences between an older version and the current version of your database. Great for listing all the work you did for your client or boss! Modifications made by your users to a deployed database. Great for understanding new and modified queries and reports. Important if your users claim they didn't change anything. Data changes made to your version or a client's version of a database. Great for detecting new or modified data, changes to lookup tables, etc. You worked on the database at home, came back to the office and forgot to update the office version before making new modifications. It's awfully nice to be able to reconcile and save all your effort. Missing one item could cause a bug that haunts you later! See the product guide for a complete list of features. Due to the differences between Access versions, there is a separate version of Total Access Detective for each version of Microsoft Access. It can compare all the database formats that its Access version supports. For instance, if you are using Microsoft Access 2016, Total Access Detective 2016 will run in Access 2016 and compare Access ACCDB (2007-2016) and MDB (2000-2016) database formats. 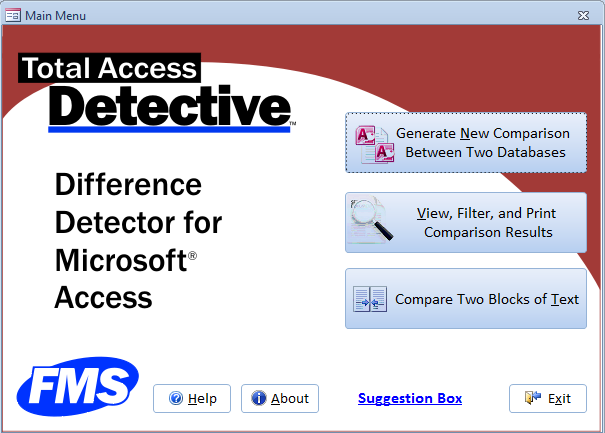 Simply choose the Total Access Detective version for the Access version you are running. Since Microsoft Access 2013 discontinued support for Access Data Projects (ADPs), if you need to compare ADPs, you must use a 2010 or earlier version. Save Time and Headaches: Guaranteed! 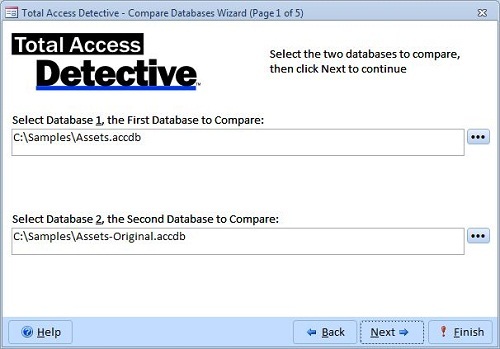 Total Access Detective is invaluable when you need to know the exact difference between your Access objects and databases. Discover why so many Microsoft Access professionals count on Total Access Detective to be more productive. We guarantee Total Access Detective will pay for itself and delight you with its flexibility and ease of use. If you are not completely satisfied with Total Access Detective, return it within 30 days for a prompt and courteous refund.